S/Y NIRVANA – Superyachts News, Luxury Yachts, Charter & Yachts for Sale. Sailing Yacht NIRVANA is a beautiful 2007 Luxury Yacht of 53.5 metres in length.Vitters Shipyard built and launched the yacht. Aluminium was used for the construction. As for crew, she requires around 9. She has a draft of 10.0 meters and a beam of 11.5 metres. She was built in Netherlands. 10 is the total number of guests that can be accommodated aboard for sleeping. 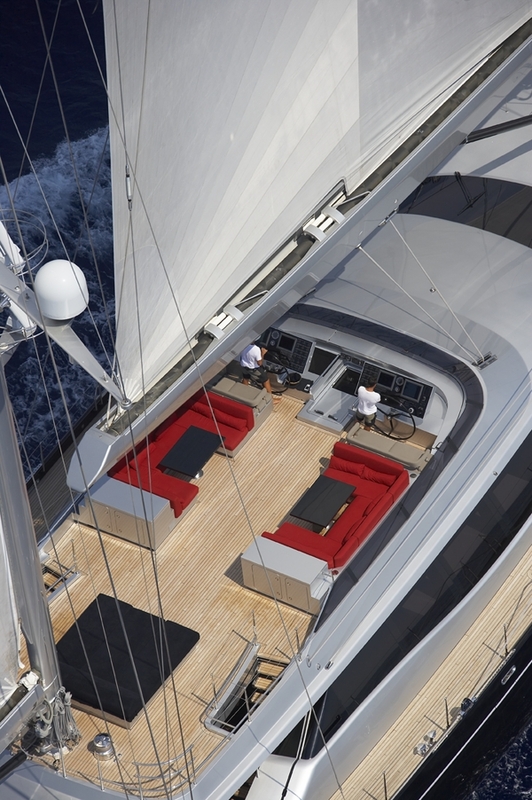 Nirvana takes advantage of a large fly bridge sailing yacht experience but has an added, particularly interesting feature: a total draft of no more than 9 feet (3 metres). This has been achieved by developing a full-bodied hull form with generous beam, high ballast ratio and a pivoting centreboard to take the draft to 10 metres when fully deployed. This high aspect ratio foil gives efficient upwind performance while the combination of generous beam and high ballast ratio gives excellent stability. A full programme of tank testing perfected the design and we see this yacht as having particular appeal to those wishing to explore shallow coastlines and being able to anchor quite closely to a beach in the right conditions. Superyacht Nirvana will have a particularly exciting visual appeal both outboard and inboard. At the Ft. Lauderdale Boat Show Awards Gala, Vitters Shipyard’s latest launch Nirvana took home the International Superyacht Society Design Award in the category Best sailing yacht above 40m. After winning the “Prix du Design” for Nirvana during the Monaco Yacht Show 2008, the Superyacht Society’s accolades again confirm Vitters’ position at the top of the international yachting industry. The interior layout was worked up between Dubois Naval Architects and the interior designer, Josep Juanpere Miret of the architects office GCA in Barcelona. The design defines a contemporary and elegant style, according to the precious materials and the strong care for details. Horizontal lines predominate in the furniture design, together with special pieces made to bring attention to singular spots. The Yacht materials are elected for their warmness and variation of tonalities and textures that create strong contrasts of light; the ceilings are alternating surfaces covered with big slats in light striped oak and domes in light leather, the walls are alternating dark mongoy with fabrics and leathers, the ground is a very dark oak parquet. Most of the lighting is formed by indirect lines focusing the material variations and the relevant parts of the furniture. stairway, with its lightness and visual transparency. It is a high-tech piece, keeping an apparent simplicity. The superyacht’s interior, with a decor by GCA Arquitectes Associats of Barcelona, is deceptively simple, concealing a wealth of clever design. between high-tech solutions and the homely character they were aiming for. foremost item in the design brief: To build a comfortable and well-performing yacht with luxurious interior spaces, with a draught of no more than three meters. Because of the latter limitation, the overall design became a balance between draught and beam. As a result, Nirvana has a relatively low wetted surface area, with no keel and no large bulb (which is very expensive in terms of wetted surface). Nirvana combines a wider beam with a daggerboard, which in the down position gives the yacht a 10-metre draught. As the ballast is in the hull rather than a bulb, the yacht has a relatively wider beam of 11.50 metres. Her overall length is 51.70 metres and Nirvana carries 155 tons of ballast. The additional weight and hull volume do not have any negative consequences for her performance. On the contrary, the reduced wetted surface area and deep draught daggerboard give Nirvana impressive upwind speed potential. captain drives the yacht under sail. continuous space, including the surrounding sea in the full picture. The aft cockpit is a logical development from the luxurious salon (or maybe vice versa), showing the fluidity of space concept in its optima forma. is that the furniture needs to withstand the outdoor environment. style. Highlights include a sauna and a rain-shower, while the shower compartment is finished in glass with floors in bare wood. As people say “Beauty is in the eye of the beholder”, many people will have different ideas on the interior and exterior styling. It is new, it is fresh and has a lot of warmth in it. All aspects of modern comfort are covered and it is the true result of a passionate quest for the statement the owners wanted to make. You can add more info (images, videos etc) of S/Y NIRVANA below. I am seeking a suitable opportunity as Chief or strong 2nd stewardess. I have 4+ years in Luxury yachting along with many transferable skills. I am currently in Fort Lauderdale, and have added my profile & CV, to Live Yachting. I am interested in employment as a deckhand or mate on your yacht. I have a passion sailing/cruising and the work it has to offer. I have high energy with the enthusiasm that is needed on all boats. I over 8000NM and have delivered some luxury yachts over the past 1 and a half yaers. If my CV is needed please don’t hesitate to ask.